Know plenty about football? Love the game? There’s a new way to turn your passion and knowledge to cash. On the football stock exchange there’s no betting on match outcomes. No corner counts. No both teams to score. Buy shares in high performing players. Use your knowledge or tips to make the right picks. Earn dividends. Sell for a profit. This is all about the players. Know your players, increase your winning chances. The new footballer trading stock exchange has been created by Jersey registered Football Index.co.uk in partnership with BetIndex Ltd. The license to trade is held with the UK Gambling Commission, the well known UK gambling body. To get started and make your first trades just visit the Football Index site and register an account. Make the minimum deposit of just £10, get the bonus, and you’ll be buying shares in footballers in minutes. Sell and buy for as little as 25p a share. Reviews of any service or product are useful for working out if they’re valuable, so here we’ll review what Football Index is all about. Billed as a ‘football stockmarket’ by the firm, it’s actually a football player trading platform where you’ll earn dividends on your shares based on how well they’re performing, and by buying and selling shares in football players for a profit or loss. Select wisely on the futures type market and it’s possible to win again and again through dividends while maintaining the original wager amount. Don’t forget that you might lose money too. Be cautious, only trade with money you can afford to lose. If you’ve ever bought shares on a financial stock market it’ll be easy to understand how the Football Index player trading platform works. It’s all explained here. Just the same as with company shares – where you buy at the market price and watch your investment as that fluctuates up or down with the performance of the company – on this football trading stock market you’ll be buying shares in players which can earn you performance-related dividends and either increase or decrease in value, and watching how they perform. This list contains 200 of the world’s top players, with the price to buy at that point in time. Anticipate who’s going to put in a special performance in an upcoming match or matches, and watch the games to see if your analysis was correct. You can pick any players – similar to a fantasy football squad – and buy or sell up to 100 shares (known as futures) at a time. Contains players that can get voted onto the first team list. Each Friday the two players with the most votes get promoted to the 1st Team at a price of 0.25, and the two first team players with the lowest prices move down. Don’t see your favourite player on the lists? Know about a dark horse player that’s set to rise up the ranks? No problem, you can add them by clicking the + button and submitting their name and their current club. Anyone can add up to three new players per year. In future it’s expected that the trading platform will expand to cover a significantly higher number of footballers, perhaps eventually covering every player you’d want to consider having a share in. The third list shows those players in the news for one reason or another. It’s compiled by taking mentions of player names from 25 different UK football news feeds, with a little magic added to arrive at the buzz score. The Player showing at the number 1 spot in the Buzz list at midnight each day is the winner. Various forms of media are used to rank the Buzz, including Talksport, UEFA, The FA, ESPN, FIFA, Football League, Daily Mail, Daily Star, The Times, Telegraph, Independent, Express, Guardian, Metro, Daily Mirror, BBC, Football365, Goal.com, Huffington Post and Sky Sports. Stories appearing in each of these football news outlets are then rated using a model called AFINN-11. This is a sentiment analysis model that essentially rates stories based on whether they are seen as having a positive, negative or neutral bias. It’s not clear which of these contribute the most, although you’d have to be thinking that positive views are highly important. Each player in the list has a value. For example, the Wayne Rooney share price may be listed as £5. This means you’ll need to buy shares at £5 each. You can buy as many shares in Rooney as you like, or just buy one, or spread the risk and buy different players as long as you don’t trade more than 100 shares in a single transaction. Selling players is as easy as buying, and the instant liquidity offered by the platform ensures that you can always be guaranteed a sale at the price on offer at the time. What Changes The Price Of Players? The only thing that moves the price or value of a player up or down is the level of demand from the buyers. That’s you! No demand and lots of shares being sold, the price drops. Big demand with lots of shares being bought, the price increases. You’ll see that it all works in similar ways to a regular stock market. The value of a football player is not directly linked to winning the Buzz or in fact how they perform. Though clearly it is indirectly and those will both have an impact on how a player is perceived. See the section on tips for making good value buys below for some ideas on what to watch for when making your buying/selling decisions. Instead of buying individual players, you can buy a whole group of the Top 25, 50, or 100 in one go and at the quoted price. The Top Player tracker price will rise and fall like any individual. The price you’ll see quoted is for 1 x Future of each player in the relevant list, but in any one bet you’re able to buy up to 100 Futures. Once a week the bottom two first team players are relegated to the squad, and the top two squad players move up with an opening price in the first team of 25p. Times of the moves are staggered to allow everyone the chance to buy, with names determined at 9am, but not moving up until 1pm and 1.15pm respectively. The units that you buy in players are effectively bets on how they’ll perform from that point onwards. Their price may fluctuate. If a player ends up as the Buzz winner, you get 5p added to the price of every unit you hold for that player. These are known as 5p win dividends. You can win 5p dividends on a player as long as he remains in the top 200 footballer list or the first team squad. At first only the top 200 were locked in for the following 24 hours, but from November 2017 this will be superceded by a new rule which makes players eligible via by a variable daily purchase deadline. This will allow for increased levels of match day trading and the chance for investors to earn more dividends. Players from teams in Spanish, English, German, French and Italian Leagues, plus Champions League and Europa League will be available to purchase from November 1st 2017. As the price of your chosen player or players increases you’re able to sell at a profit, or in fact take a loss without losing everything if he under performs! The footballer trading platform is essentially a futures market. If you do activate your sell option, the platform needs to find a buyer at the price. That’s how Football Index make their money, they take 2% commission on the deal. Basically you’re either increasing your money by dividends as a ROI (return on investment), or by capital appreciation (your players rise in value). Dividends are paid by football Index, while the rise in capital value is driven by other buyers on the platform. Putting money into your account to buy players couldn’t be easier, with multiple payment methods accepted. Sell whenever you like, and just request a withdrawal which will go straight to your depositing bank account or ewallet. The short answer is yes. Football Index hold a UK Gambling Commission license, which means they’ve been fully vetted and are allowed to run the platform in the way described. The UK is one of the safest countries in the world for any form of financial type trading. There’s a lot of monitoring and your money is safe. Whenever you’re involved in anything that carries a risk of losing money – or even the potential of winning it – stuff can go wrong. Most likely that’ll end up with you losing some or all of the cash you deposited. The good thing about Football Index is that you can’t lose more than your initial stake. If you buy a player share for £5, the worst that can happen is the value goes down to zero. Of course, if you buy hundreds of futures you could risk losing a significant sum. Perhaps the key here is to play the market carefully at first, only moving up to bigger buys when you’re confident and/or can accept the risk of losing without any major negative impact. Remember there is potential for any player shares to reduce in price unexpectedly. Your player could get injured or have a bad run, and you could be left exposed if the price drops quickly. The key here will be to keep up to date with what’s happening in the football news. Plus it’s worth keeping an eye on the top 200 list – if it looks like your players may drop out of the list it could be wise to sell as they’ll probably see their share price reduce. FootballIndex originally offered a welcome bonus for anyone registering an account and making a deposit. If you haven’t heard of this term before, it’s where a betting operator gives a bonus to attract new players. The Football Index offer was to match your deposit with an equal value to the same amount, of up to £25. Basically you deposit £25, and you actually got £50 in your account to buy shares with. Bonus money of this type can’t normally be withdrawn, so you can’t make the deposit then withdraw immediately and walk away with £25 profit. There are wagering requirements that prevent this. You’ll need to spend your bonus on buying players, but after that anything you win will be yours. Still it was a good offer, and the bonus you could take up could be as low as £10 for just a £10 deposit and risk. Unfortunately the welcome bonus offer is no longer open. It’s been replaced by one that could be equally valuable – the Football Index trade risk free for 7 days offer. As long as you’re a new depositor you’re eligible for the 7 day free trading offer. It’s still currently available and means that anyone depositing at least £10 gets their first 7 days to try out the platform, buy some player shares, and see if they can make a profit. Any losses up to £500 in this period will be refunded, with a straightforward request to Customer Services kicking off the refund process. There are of course some sensible terms and conditions around the offer, for example limiting it to one per household etc, and these are all spelled out on the site. As the platform grows and evolves, we’ll add more info to this review. For now, if you think you’ve got what it takes to get ahead of the pack with your selections, then get picking while the risk free offer is available. If you’re looking for one clear strategy, you won’t find many substitutes for simply knowing your football and the players involved. In fact precise knowledge of the team you support can often yield some good results. It’s obvious that having the world’s best players in your portfolio can result in profits. But of course they’re the ones everybody knows. If you only pick top players, you may be exposed. Buying and selling at the right time is all important. The trick is in forming a balanced portfolio. One tip here is to keep a constant eye open for potential improvers before everyone else sees them. Maybe consider a percentage split on your portfolio – 20% to up and coming players, 35% to the middle group that have a chance of turning in a big performance, and the rest on tried and trusted experienced big names. Remember as well that football is a team game. Often if a team is under-performing, their individual star player may not be getting the support he needs to shine. So keep watching for fluctuations in team performance which might affect how a specific player in the team performs – and watch out for player and team news, especially during the period leading up to and during big games or tournaments. In the off season periods remember that most player news will be around transfers, so keep an eye open for transfer rumours that might generate some interest. Twitter is obviously a useful tool for this, though take note that you can’t earn dividends on players until you’ve held shares in them for 24 hours. Tournaments are obviously a good source of player news. The World Cup of 2018 is a great example of one of the major football tournaments, and remember there are plenty of other ways to turn a profit if footballer stock trading doesn’t grab you. Betting on asian handicaps on the World Cup is one potentially profitable option. Actively watch as many games involving your players as you can – fluctuations in prices will be seen before, during, and after matches. In-play trading should be at the forefront of a successful trading strategy. You can watch out for good players returning from injury – if you can identify what was ailing them and be reasonably sure it’s fixed, then they could recover some older form and have a good run going forwards. The great thing about this trading platform is that your players don’t even need to be on the pitch to increase in value, even rumours that aren’t true can have an impact as we occasionally see on the regular financial trading markets. With the mighty German team being among the favourites for the competition, it’s worth noting Thomas Mueller, while the lone striker Mario Gomez could also make a name for himself. It’s likely that German goals will come from either of these two, and with team progression to the semi-finals expected it’ll be no surprise to see player values rise on the back of strong performances. France on the other hand can count on a host of potential goal scorers in their squad. Picking one to grow in price isn’t easy though. Will Wales go all the way? If you think so then Gareth Bales shares may be worth a look. Getting the Buzz winner consistently can clearly mean good news for your account balance. Of course the winner each day could come from any name on the first team list, but knowing who previous winners have been can help to narrow down what might happen in future. Here’s a string of daily winners over around a 3 week period. There are some names you’ll instantly recognize, and see how many appear on consecutive days….. Previous Buzz winners can also be found on the Football Index Tumblr page. There’s little doubt that this new trading platform could have wide appeal. You can get involved for as low or as high an amount as you want, and use knowledge and skill to line up a profit quickly or over time. At the same time you can limit the amount you could lose. For anyone used to trading on the stockmarket – or even with no trading knowledge at all – the Football Index.co.uk football player stock exchange is simple to use and easy to understand. Use your own knowledge of football to buy players that might in future trade at higher prices, or watch out for tips on which players are coming up through the ranks. There may even be ways to incorporate trading with regular football betting activities, in particular if used in tandem with a high quality soccer betting prediction website. It’s still early days for the trading platform and at time of writing I’ve not been able to find an app. Until Football Index release one you can of course just navigate straight to the shares website. During the period from March to May 2016, Football Index launched a crowdfunding initiative designed to inject some serious investment cash into the platform – clearly with some big development plans in the background. The proposition put forward for investors of ”a unique and compelling proposition: BUY, SELL, BET, indeed “invest” real money in the world’s Top 200 football players. Build value in your portfolio (capital appreciation), earn dividends (ROI), and ultimately sell at a profit” proved to be a hit with over £1 million being pledged. 20% of the funds from the investment campaign are earmarked for technology/infrastructure development, with 80% going into a marketing budget. Free games are also under development, no doubt with the intention of bringing in plenty of potential new buyers – all of course great news for the liquidity in the markets. Football Index free games may make an appearance first in China, given one of the deals is with a firm known as Webet which is actively growing its brand there. After China it may well be the US, where gambling is restricted but interest in free gambling type games isn’t and is growing exponentially. To keep up to date on other improvements to the platform you can visit the ‘what’s new’ page. There are a number of ways of making football related profits, with most being easy to find and try out. 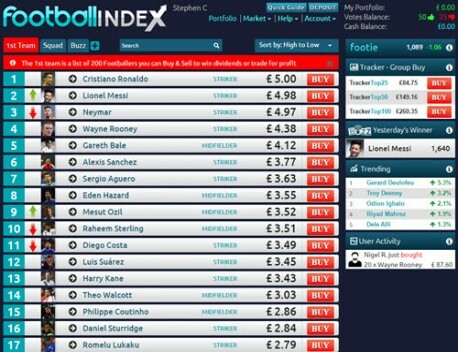 For me though, Football Index’s footballer share trading platform does stand out as a low risk, entertaining way to make money from football knowledge, one that can give sustained interest over the course of a season, let you have an extra interest in the performance of favourite players, and potentially fill up your wallet to boot. Since its launch in October 2015 it’s clear that the platform has gone from strength to strength, with a vast base of regular traders and huge numbers of new users. Football Index are constantly reviewing how the platform works, and have recently made a number of improvements. There are sure to be more, and with good sign up offers allowing you a no risk way of making your first trades there aren’t too many reasons why it’s not worth giving it a go. Football Index’s footballer share trading platform is unique – there’s nothing quite like it. But you can of course try to turn your football knowledge into cash in other ways – traditional betting being one of them and spreadbetting another. Perhaps even combining the three and holding some footballer shares, and also betting on the teams in individual matches or even on a number of match markets like corners or penalties. You can also trade using a betting exchange and even set up some potential arbitrage opportunities. For example you can buy goals in a match that you believe will be high-scoring or sell the time of the first booking if you think there will be an early yellow card. If all that does sound interesting, remember that whatever you do risking your money. For spreadbetting you can take a look at firms like City Index and Spreadex, but for a good football betting site it’s worth trying BetVictor. They have a wide range of markets, in fact covering pretty much every type of bet you’d want to place. Deposit and Bet £10 with BetVictor to receive £30 in free sports bets and £10 in free casino bonus.